"Make the SDGs explicit, not implicit. We are setting up for a decade of delivery. Work out how you can communicate what you are doing to the heads of your country," – Richard Curtis from Project Everyone last week at Davos House at the launch of the Agenda for Partnerships to achieve The Global Goals. Rikke Rønholt & Majken Gilmartin. 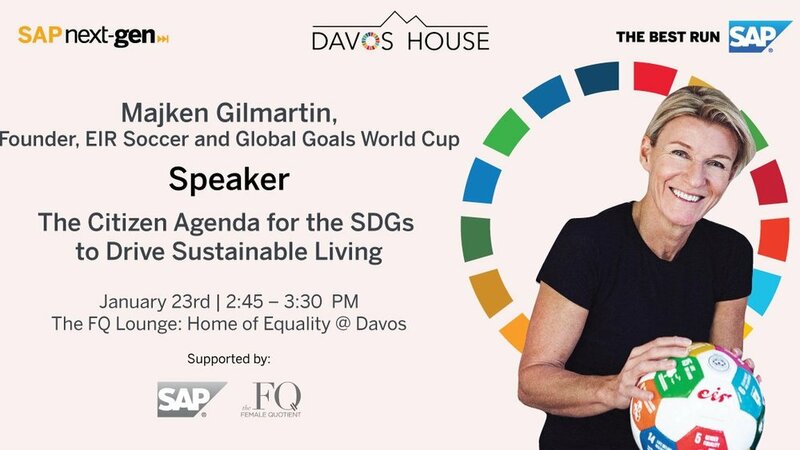 Davos Jan 23, 2019. Photo © SAP Next-Gen.
And we can’t help but being proud of all you players and thankful to our partners and volunteers who have been speaking up for the world, speaking up for the Goals with so much love since the beginning in 2016 - soon 10 Global Goals World Cups ago. Yes, the coming Global Goals World Cup in Mumbai is the 10th tournament. Since our initial tournament, at the Women Deliver Conference in Copenhagen 2016, over 2,000 women have taken the ball in Copenhagen, Nairobi, New York, Bangkok, Buenos Aires, Johannesburg, Dominica, and Dubai in helping raising awareness and taking action for the UN Global Goals and reaching hundreds of millions with the message: Women are powerful agents of change and creating new active female role models. We are in awe on how you all are sharing your incredible passion and believing in the power of your teams and the GGWCup movement. For us Davos was a wonderfully busy day packed with lots of speaking, playful conversations with different people from various positions and organisations from around the world. With everyone of them we shared your story, your actions, and how you are using sports to accelerate the change and to impact through your actions. You were all with us in Davos and next step for us is to follow up on all the conversation we had with our global and new partners to find ways to build this new type of tournament for the world and have your actions resonate and reach even more people. SAP Next-Gen and Ann Rosenberg, thank you for hosting us in Davos. But first. Mumbai. This Saturday. February 2nd. If you are not in town, please comment, like, share and give the spectacular teams all the virtual love and shine you can right here. Bring it on! The Global Goals are everyone's. Thank you all for being with us on this journey. See more pictures here - incl from the 7AM launch of The Citizen’s Agenda for the SDGs.